California is experiencing a superbloom in the deserts this spring. So, just what is a superbloom? The normally dull and dry areas of the California deserts are alive with color this spring. Waves and drifts of wildflowers reach to the horizon and people are traveling great distances just to see them. The desert blooms every spring, however specific conditions must be met before a superbloom happens. For the past few years California has experienced severe drought. 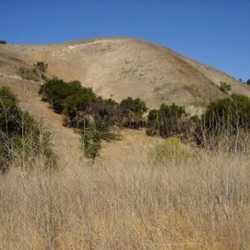 The lack of moisture caused many plants and grasses to wither and die. This left the ground clear for seeds that were laying dormant for quite some time to germinate. However, for the dormant seeds to germinate, the region needed to experience an unusually wet autumn and a cool winter. The rains soaked into the bare ground and the cool winter temperatures kept the moisture from evaporating. The result is the wonderful drifts of golden California poppies, purple sand verbena and many other colorful flowers that we call the superbloom. Technically, the difference between a normal display of spring wildflowers and a superbloom is an explosion of wildflowers that greatly surpasses conventional expectations of the spring show. The wildflower that headlines this show is undoubtedly the California poppy, (Eschscholzia californica.) This iconic symbol of the Golden State is native to the U.S. And Mexico, however it is happiest in the deserts of northern Mexico and southern and central California. It blooms in the familiar golden shade, however it also comes in yellow, salmon, red and sometimes pink. The California poppy is a tough little wildflower that withstands some of the harshest and driest conditions because its seeds remain dormant until enough moisture and sun combine to allow them to germinate. In most situations, it behaves as an annual where it grows, blooms, sets seed and dies all in one season. The seeds fall to the ground, waiting until the conditions are best again. In optimal conditions, it is a short-lived perennial, lasting a couple of years. All over the area, there will be some poppies that find these great conditions each spring, however it is only after an extended drought and wet fall that the superbloom takes root (pun intended.) 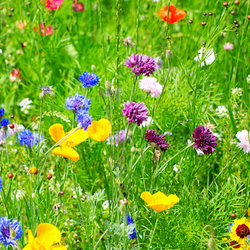 The desert comes alive with masses of wildflowers that often reach to the horizon. The bloom often covers so much territory that it can be seen from space. The superbloom is not only a pretty sight, it is a wonderful asset to some wildlife. The California poppy is the host plant to the American Painted Lady (Vanessa virginiensis) butterfly. Unlike the Monarch that only uses milkweed species for a host, the American Painted Lady uses a number of plants to lay their eggs, however the California poppy is especially a favorite. Like the Monarch, the American Painted Lady also overwinters in warmer areas. Once the flowers start to bloom, it quickly moves north and people often see great numbers of them quickly darting by. Unlike the Monarch that tends to float on the breezes, this little butterfly is a speedy little fellow that can reach speeds of 25 miles per hour. 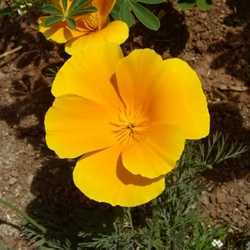 The California poppy is also a good friend to honeybees since it produces vast amounts of pollen for them to collect. Don't worry allergy sufferers, the pollen isn't windborne. If you want to see the superbloom, please bear in mind that the desert areas where it is happening have a delicate ecosystem. Reports of hundreds of thousands of people descending on little towns like Lake Elsinore read like horror stories. People parking on right of ways, in private driveways, trampling through the flowers, letting dogs loose to wander and leaving trash is first of all not polite...you are a visitor and should behave like one! Secondly, it harms the desert and the flowers that so many want to see. Traffic is almost at a gridlock situation and that many engines spewing hydrocarbons in the atmosphere is also counter productive to the fragile environment. The reports of the crowds remind me of the Great Total Eclipse of 2017. The point of the longest duration was about 40 miles from my home and the traffic was horrible. Trips that should have taken 30 minutes turned into 4 hours. Be respectful, or don't go. If you do go, remember to stay on marked paths and view the flowers early in the morning shortly after sunrise. Later in the afternoon, the flowers tend to close up in the heat of the day. Experiencing the superbloom should be a wonderful experience for all and there are a number of places that it can be viewed without the monster crowds. Check with your local area to see if one is nearby. If you miss this one, take heart, superblooms happen every so often, and you can predict it by taking note of drought conditions before a cool, wet, fall and winter. Just remember that the desert is a fragile place and to limit your personal impact to the smallest footprint possible.